Attorney General Jeff Sessions said he would release a decision today, June 18th aimed at limiting the reasons why people can claim asylum in the United States. In a speech before immigration judges in Virginia last week, Sessions said the valid reasons for asylum have been expanded, extended, and has proliferated under the Immigration and Nationality Act (INA). This particularly occurred during the Obama administration. He said his decision is aimed at making sure “asylum” is granted only in cases outlined under U.S. law. “Under the INA, asylum is available for those who leave their home country because of persecution or fear on account of race, religion, nationality, or membership in a particular social group or political opinion,” he said. To bring this in compliance with the law, Sessions announced that as AG he will be taking control of the ‘immigration court system’ in the United States. As it is now, cases involving immigration are tried and adjudicated via the Executive Branch of the Federal Government, hence the White House. As a result, the AG has the responsibility to determine final decisions on all immigration cases. This traditionally has been delegated to courts and other authorities just because it is a massive job. But now, that will be changing. Asylum seekers do not illegally cross the border to make application. This scam is coached by activist immigration attorneys. At the heart of this change is Sessions’ desire to stop the abuses by illegal immigrants using political asylum to gain legal status. This stemmed from a decision by the Board of Immigration Appeals to allow victims of domestic abuse to use this designation. In the past, it has been used for groups of people who were subjugated by their governments. And while noble, it opened the floodgates for illegal immigrants to gain status. Much of which is the result prior Clinton and Obama administration weakening policies of enforcement and creating loopholes. “The asylum system is being abused to the detriment of the rule of law, sound public policy, and public safety— and to the detriment of people with just claims. Saying a few simple words—claiming a fear of return—is now transforming a straightforward arrest for illegal entry and immediate return into a prolonged legal process, where an alien may be released from custody into the United States and possibly never show up for an immigration hearing. This is a large part of what has been accurately called, “catch and release”. During the Obama administration, powerful incentives were created for aliens to come here illegally and claim a fear of return. In effect, word spread that by asserting this fear, they could remain in the United States one way or the other. Far too often, that rumor proved to be true. Be aware that “word spread” as a result, an extensive and robust public relations campaign be multiple departments of the U.S. government, the Justice Department, State and Homeland Security. Credible fear claims under the Obama policies have skyrocketed, and the percentage of asylum claims found meritorious by our judges declined. The AG stressed; “That’s because the vast majority of the current asylum claims are not valid.” Essentially, it opened the gates for nearly everyone; coyotes, drug dealers, human traffickers, MS-13, and other criminals, and those entering illegally. Remember, the political-left is begging the trump administration to keep “dreamers” in the country, but a vast majority of those so-called dreamers are criminals. Consider the fact that for the last five years, less than 20 percent of claims have been found to be meritorious after a hearing before an Immigration Judge. In addition, at a minimum, at least 15 percent of claims are found invalid by USCIS as a part of their initial screening. Further illustrating this point, in 2009, the Department of Homeland Security conducted more than 5,000 ‘credible fear’ reviews. By 2016, only seven years later, that number had increased to 94,000. The number of these aliens placed in immigration court proceedings went from fewer than 4,000 to more than 73,000 by 2016 – nearly a 19-fold increase- overwhelming the system and leaving legitimate claims buried. The cost while being held per illegal alone is between $36,000 and $40,000 per year. “So today, I’m exercising the responsibility given to me under the INA, and I will be issuing a decision that restores strong principles of asylum and longstanding principles of immigration law,” he said. AG Sessions said most asylum claims are later found by immigration judges to be invalid, and said the more the U.S. does to clarify the law and practice, the fewer illegal immigrants would actually even make their way to the border. Sessions and the Trump administration are insistent and determined to enforce the immigration laws of the land that are on the books, period! The intent and purpose of the AG move is to deliberate to affect and block any deceptive political efforts (in legislation) that may be put forth in any form of an immigration bill presented by Congress that subsequently reaches the President’s desk. While the President may or may not sign what’s put before him, it won’t matter because the laws and the enforcement of those laws will block and restrict whatever liberal mumbo jumbo crafted and presented by the Congressional Establishment. Historically, it should be remembered, and most don’t know this but ‘asylum’ was in fact created as a deterrent to specifically to stop foreign governments from instituting ethnic cleansing, persecution, and genocide. Changing the meaning of that by the Obama administration made a big loophole in which unproven claims of abuse could be used to gain legal status. On the surface this will look like a cruel move. That’s the way and how Democrats and the political-left will peddle it for sure. But ultimately it will be Congress that will need to change the law if they disagree with AG Session’s decision. Unfortunately, to many of the judges, Sessions’s hard-line immigration stance and agenda is increasingly standing in the way of their ability to mete out justice. Opposition to Sessions among their ranks, is more about the pressures he has put upon the office than about his stance on immigration. The immigration judges ultimately report to Sessions. His office controls which cases they will hear and can force judges to prioritize certain cases and send them around the country to work. Mr. Sessions has assigned 18 immigration judges to work at detention centers near the border, about a 50 percent increase in the ranks of judges handling immigration cases in those areas from the Obama administration, with likely more follow. It’s obvious to see where AG Session’s stance on illegal immigration is … and we know ultimately where of that is coming from. 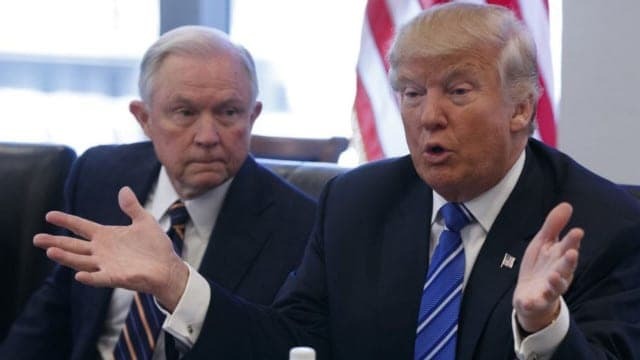 “Zero tolerance” — The Session-Trump strategy allows the President wide discretion in how he talks about and makes the decision on what “policy” he should sign — while at the same time knowing and ensuring the tough laws on the books are once again enforced to the fullest extent to protect America’s safety and security.